I love wrapping gifts almost as much as I love giving them. Whether you want to thank your child’s teachers, show your friends how much you appreciate them or simply want to show up to a dinner party with a hostess gift, a beautifully wrapped gift is always a thoughtful gesture. Here are 3 ways I wrapped gifts this year. POM-POM: Wrap yarn around cardboard about 40×. Take the yarn off the cardboard and tie it tightly in the middle. Cut the loops and fluff the yarn. Use scissors to trim the yarn to make it circular. FOR KIDS: I know Max is too young to remember his first Hanukkah, but I still wanted to find fun ways to wrap his gifts. 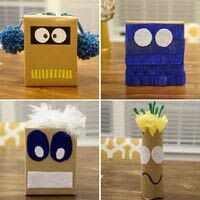 I used colorful felt paper, tissue paper, pipe cleaners and feathers to create different monsters. 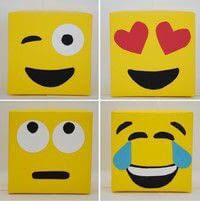 FOR GIRLFRIENDS: I was inspired by Studio DIY’s Emoji gift wrap post and picked out a few of my favorite emojis.